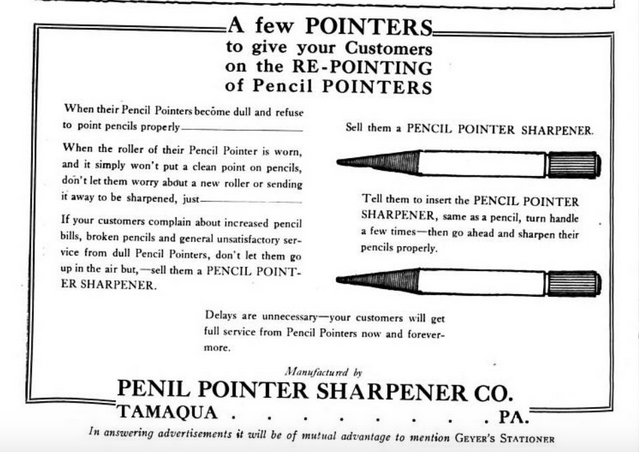 A long, long time ago–in the era of classy catalogs with lovely engraved drawings–they were called “pointers”! 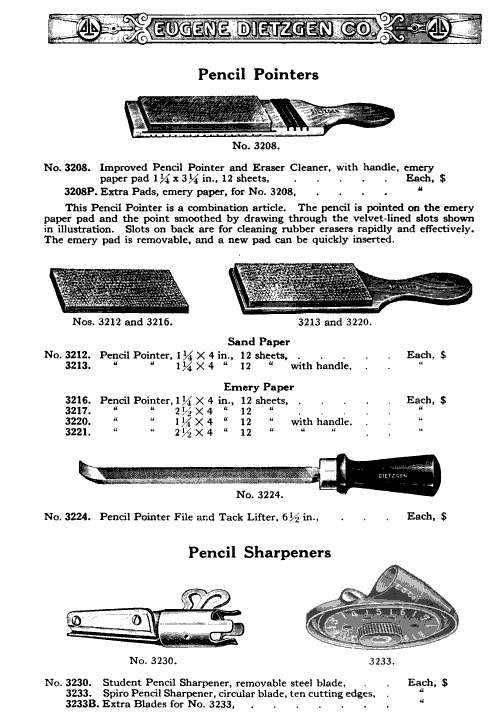 Before single-blade and hand-crank “sharpeners” came to prominence, most pencil users “pointed” their pencils with a knife, carefully cutting away wood to expose a length of graphite, and then even-more-carefully whittling the newly exposed graphite into a point. Since early pencil lead was brittle, the points often broke off, and some pencil users “shaped” their pencil points instead by holding the pencil at an angle and rubbing the exposed graphite on a piece of scrap paper. This last step, the deliberate erosion of the tip, could be sped up if one rubbed the point on a strip of sandpaper affixed to a sturdy backing. Some artists and draftsmen still use this type of “pointer,” and you can find them at well-stocked art-supply stores. The sanding method gives you greater control over the shape of the point, enabling you to create a needle-sharp point, or a chisel tip, and a few other special shapes with specific drawing or drafting applications. They weren’t kidding. Sandpaper pencil-pointing is vehehehry messy, producing fine, dark dust which gets on your work, your hands, your clothes, your floor, and your furniture. It gets on the pencil point too, from there sprinkling gently onto your drawing and smudging it before you notice. For this reason, some pointers featured velvet or rubber grooves for gently brushing the dust off of your newly formed pencil point. Sandpaper pointers are a thing of the past mostly, and maybe for good reason, but why did we ditch “pointer” and replace it with “sharpener”? Consulting the Google ngram, we can see that the phrase “pencil pointer” peaked around nineteen twenty. By that time, “pencil sharpener” was already four times as popular, and grew in popularity over the ensuing eighty years, while “pencil pointer” dropped down almost to zero. You might notice an uptick around 1995. Was there resurgence of interest in old fashioned pencil pointing methods? Sadly, no. The “pencil pointer” of the mid 1990s refers to the stylized cursor which started appearing in desktop publishing software and other computer programs of the time. 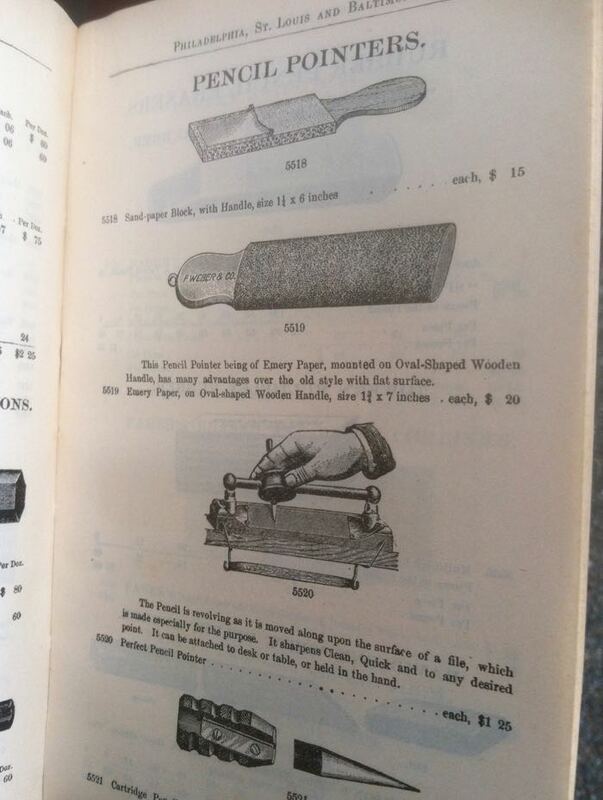 As I explored antique catalogs, I noticed that many, if not most, of the catalogs issued during and after the 1920s distinguish between pencil tools–using “pointer” for the sandpaper types and “sharpener” for the bladed types, as they do in the Eugene Dietzgen & Company catalog from 1921. 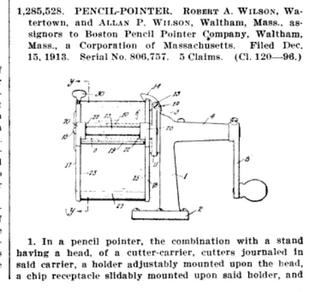 However, the United States Patent Office, in their official gazette, issued on November 1918, retained the older, more accurate term, as did the patent holder, in their company name, Boston Pencil Pointer Company. Lately, I’ve been saying “point” instead of “sharpen.” I like the older word. I like the exactitude of it. And it’s fun to be pedantic about your special hobby. But we must keep in mind that language is never going to be as exact as we want it to be. Words are constantly evolving, being stretched and smudged, sometimes even sharpened, to meet new needs, to describe new realities, and to make new points. Here’s an ad from Geyer’s Stationer in 1921, describing a charmingly “meta” product, mixing up terms and meanings, and ending with a rather unbelievable typo. I think this one sums it up. For me, the go-to sharpener would be no. 3233. For me, the go-to sharpener would be no. 3233. Hi Ross.